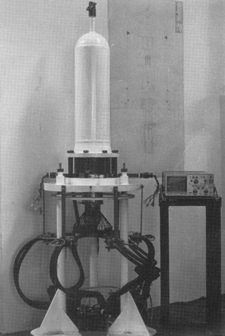 William Beale, Professor at Ohio University, invented the free-piston Stirling engine in 1965. "...These imperfections have been in great measure removed by time and especially by the genius of the distinguished Bessemer. If Bessemer iron or steel had been known thirty five or forty years ago there is scarce a doubt that the air engine would have been a great success... It remains for some skilled and ambitious mechanist in a future age to repeat it under favourable circumstances and with complete success..."
Rev'd Robert Stirling applied for the first of his patents for this engine and the 'Economiser' in 1816, a few months after being appointed as a minister in the Church of Scotland at age 25. Others such as Sir. George Caley had devised air engines previous to this time (c. 1807) and other devices called air engines were known as early as 1699. 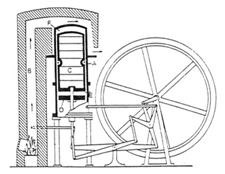 The 'Economiser', or regenerator, has come to be recognized as a most important portion of the patent of 1816. These innovations were even more remarkable in light of the fact that they preceeded the birth of thermodynamics and the writing of M. Sadi Carnot by some 40 years! Some historians have indicated that the reason for Rev'd Stirling's efforts at such a device were driven by his concern for the working people of his parishes as steam engines were being used extensively in that area and time period. Due to the lack of strength in the materials available to construct boilers ('Bessemer Iron', or Steel, was not yet available), they would frequently explode with devastating results on the people working nearby. The effects of high pressure steam on the human body are quite awful as anyone who has experienced a steam burn in the kitchen can attest. So Rev'd Stirling invented a safer (and more efficient) replacement for the steam engine, in order to save lives and improve the conditions of his parish life. Stirling's engine would not explode because the pressures were not elevated to that level. The machine simply stopped if the heater section failed. The best recorded implementation of these efforts was at the Dundee Foundry Company where Robert's brother, James Stirling, was employed. James was a very good engineer and a driving force in the implementation and perfection of the Stirling invention. A very large double-acting-piston machine with not one but two heater/displacer sections was built at the foundry under his direction (and we presume design). This engine powered the foundry for some years before material failures at inopportune times caused it to be replaced by a steam engine. With Bessimer's discovery of a process to mass produce quality steel, steam engines became more powerful and much safer to operate, and so the Stirling engine nearly faded into obscurity. The rebirth of the Stirling engines was due almost entirely to workers at Philips Research Laboratory in Eindhoven. Work on small Stirling engines started there in the mid-1930s. The objective was to provide small, quiet, thermally activated, electric-power generator for radios in areas of the world without regular power supplies. It is said the choice between steam and hot-air engines was made following a chance visit to the Museum of Technology in Paris by one of the technical directors of the laboratory whre he saw some of the old hot-air engines displayed. He believed, rightly, that modern materials and technology could elevate the hot-air engine to a performance undreamt of in earlier engines. Work on Stirling engines continued during the German occupation in the Second World War and the first information about it was released soon after the war. Brilliant research and engineering resulted in the development of small generator sets far superior to any of the old hot-air engines. However by the early 1950s the invention of the transistor and improvements in dry batteries had eliminated the original need. 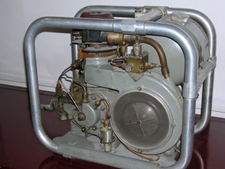 Recognizing the significance of their work, though, the Philips engineers switched their efforts to engines of higher powers and the invention of the 'rhombic drive' and roll-sock seal led to the development of a family of single and multiple cylinder engines ranging in power up to hundreds of horsepower. In 1958 the General Motors Corporation of Detroit made a licensing agreement with Philips which continued until 1970. They were concerned with Stirling engines for space and underwater power, vehicle and surface vessel propulsion, and stationary power. Following relinquishment by General Motors of the licence agreement with Philips, the Ford Motor Co. of Detroit became licensees (in 1971) and after some preliminary work and evaluation have embarked (in 1977) on a seven year substantial programme development for automotive Stirling engines funded by the U.S. Department of Energy. In the early 1960s William Beale, a professor at the Ohio University, Athens, Ohio, invented the free-piston Stirling engine and with remarkably single-minded purpose brought the device into commercial production in the form of a small demonstration engine in the early 1970s. Substantial work of miniature engines for artificial hearts has been funded for over a decade by the United States National Institutes of Health. As a result of public concern about noise, air pollution and energy conservation there has in the recent years been increasing interest in Stirling engines as micro combined heat and power units.